John McLaughlin, Donnie Trumpet and Sarah Elizabeth Charles will be releasing new projects in September and October. New music from a trio of trailblazers—one veteran, two newcomers—will excite the eardrums of jazz fans during months ahead. 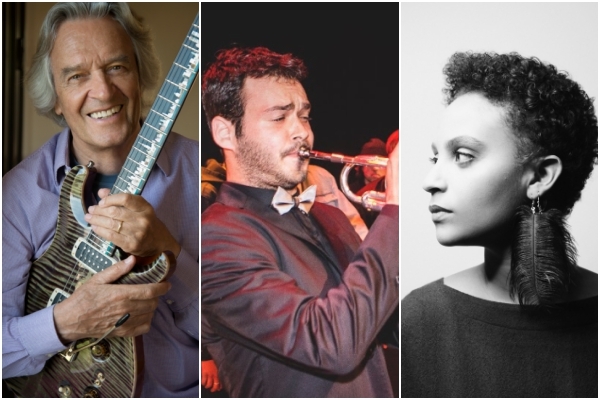 Here’s what to look forward to from guitarist John McLaughlin, hip-hop producer Donnie Trumpet and vocalist Sarah Elizabeth Charles. John McLaughlin has a long association with the London jazz club Ronnie Scott’s, extending as far back as the 1960s, when he served as a member of the club’s house band. Since then, the guitarist’s trailblazing spirit, technical prowess and improvisational ingenuity have lifted him to international renown, putting him on stage alongside fellow giants such as Miles Davis and Tony Williams. As a sideman and leader, his recorded output has been seminal to the evolution of jazz fusion. Today, Abstract Logix issues McLaughlin’s Live @ Ronnie Scott’s, which compiles audio from a sold-out, two-night stand by McLaughlin’s seismic quartet The 4th Dimension. Recorded in March 2017, the album finds McLaughlin and his crew—with Ranjit Barot (drums, konokol), Gary Husband (keyboards, drums) and Etienne M’Bappé (bass)—exploring everything from early Mahavishnu Orchestra classics to compositions from their most recent studio LP, Black Light. McLaughlin’s brain-buzzing, ground-rumbling fusion power dominates the track “Miles Beyond,” which DownBeat is premiering below. After an explosive introduction, the group settles into a woozy, vertiginous funk, over which McLaughlin’s breakneck guitar solo sounds positively scorching. Producer Nico Segal is best known as the architect behind 2015’s pop masterpiece Surf, by The Social Experiment, a hip-hop collective that brought together titans of the genre like Chance the Rapper, Big Sean, Kyle, B.o.B and Busta Rhymes. He’s also a trumpet player with a long jazz pedigree, and his latest project, Exchange, finds him swerving back into a jazzier lane. Recorded with his newly formed JuJu Exchange ensemble, the album (which drops on vinyl today) melds boom-bap drum tracks and silky-smooth horn solos with seamless precision, sounding like a mash-up between the Native Tongues and Freddie Hubbard. Sarah Elizabeth Charles is a vocalist on the rise, riding the momentum of two phenomenal previous releases: 2012’s RED and 2015’s Inner Dialogue. Those projects wedded Charles’ acute melodic sensibility to her incisive sociopolitical analysis, and on her latest release, Free Of Form, she strengthens those connections even more. Due Oct. 6, the album marks the first release on Christian Scott’s Stretch Music imprint (Scott also co-produced the album and is featured on several tracks). The project also features Sarah’s veteran band, SCOPE, which includes Jesse Elder (keys), Burniss Earl Travis II (bass) and John Davis (drums). The lyrical content on Free Of Form delves deep into the current political climate, touching on issues as pressing as mass incarceration, police brutality, drug addiction and war. “Change To Come,” which can be streamed below, was written in 2014 in the wake of Eric Garner’s death in New York. Featuring Scott on trumpet, the track is a powerful rumination on the nature of violence and its stifling effects on underprivileged communities.